Zinc One Resources Inc. (TSXV:Z, FSE:RH33, OTC:ZZZOF) (“Zinc One” or the “Company”) is pleased to announce that all data from the 2018 drill program at its 100%-owned Bongará Zinc Mine project in north-central Peru have now been compiled, interpreted, and modeled by Watts, Griffis, and McOuat Ltd. (“WGM”) based in Toronto. 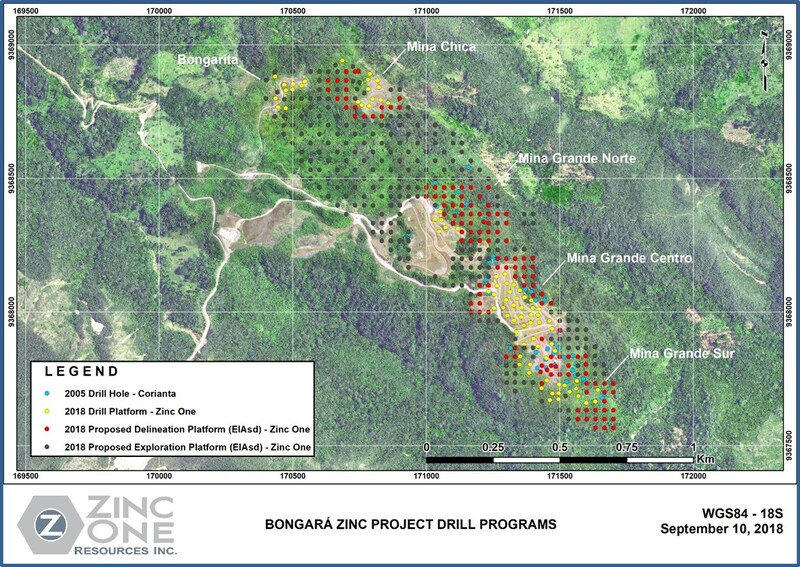 Zinc One Resources Inc. (TSXV:Z, FSE:RH33, OTC:ZZZOF) (“Zinc One” or the “Company”) is pleased to announce that all data from the 2018 drill program at its 100%-owned Bongará Zinc Mine project in north-central Peru have now been compiled, interpreted, and modeled by Watts, Griffis, and McOuat Ltd. (“WGM”) based in Toronto. The data will be used to complete an independent mineral resource estimate for the near-surface, high-grade, zinc-oxide mineralization encountered at the Mina Grande, Mina Chica, and Bongarita deposits expected to be released in early 2019. The mineral resource estimate will be the basis for a Preliminary Economic Assessment expected to be completed late in 2019. A map outlining the 2018 drill program can be viewed below in Figure 1. with additional maps available on the Company website at www.zincone.com. Zinc One has applied to the Ministry of Energy and Mining for approval to drill 583 holes from 364 platforms along a 1.4-kilometre long ridge from Mina Chica to and beyond Mina Grande Sur (see Figure 1.). The platforms planned for delineation and infill drilling of the known deposits are laid out in a nominal 30-metre grid spacing and the exploration holes on a nominal 50-metre drill grid. A total of 20, 41, 27, and 43 platforms, each platform to be permitted for two drill holes each, will delineate and, in part, infill previous drilling at Mina Chica, Mina Grande Norte, Mina Grande Centro, and Mina Grande Sur, respectively. Exploration drilling will be prioritized in favorable settings within areas of low-lying vegetation. Currently, Zinc One is addressing environmental and logistical questions posed by the Ministry of Energy and Mining, which will confirm that our proposals comply with existing regulations and allow the Ministry to grant the permit. Readers are encouraged to review Figure 1. carefully which shows the upside potential by further delineation (red-proposed platforms) as well as the upside potential by exploration (black – proposed platforms). Beyond this proposed drill program is the 8-kilometre-long trend which the Company believes also contains additional upside exploration potential. The technical content of this news release has been reviewed, verified and approved by Dr. Bill Williams, Interim CEO, COO and a Director of Zinc One Resources Inc, a Qualified Person as defined by National Instrument 43-101. This news release was also reviewed by Al Workman, P.Geo., Vice-President of WGM and a Qualified Person under National Instrument 43-101. WGM is an independent firm of consulting geologists and engineers which has visited the project regularly since 2015.